Over the last three weeks, I’ve been chugging away at My Last Days, trying to get through the first draft. 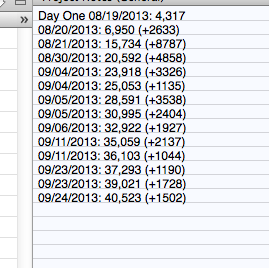 You can see the recent word count history there on the right. A couple of big days early on, but I’ve been slowing and missing days due to “real life” getting in the way. It’s been a busy month for me and I’m just now getting back to writing every day. I’m about 40% done now and am finding it more difficult than it was to get through A Sour Chord’s first draft. Maybe because I had already known how that one would end and what all the main plot points were since I wrote the short story so long ago. With My Last Days, I’m honestly making it up as I go along. My goal is to hit 100,000 words with the first draft, though I think I’ll probably end up closer to 80,000 when I’ve written all that I think the story needs. I may try to push it a little bit, though. If the editing process is anything like A Sour Chord’s first edit, I’ll lose a few thousand words that get cut out during that process, so I think I’m shooting for more so the end result is a more readable book that doesn’t feel too short. I wrote another 1,502 words this morning in a single chapter and have planned out the next three chapters to help me through the rest of this week. I realize that at some point I’ll have to go back through and re-think the entire story, its meaning, and organize the chapters into a more sensical order. Right now I think I’m just writing haphazardly to get the words out onto the paper. I wonder if other authors struggle with their second book more than their first. I’d imagine so. I think most people that write have a big idea for their first novel and power through it and then get to the second and hope they have as good of an idea as their first. On the A Sour Chord front, editing continues there. My editor, Lauren, is working through her first edit and then will go back and do a full line-by-line edit, and probably hate every sentence I’ve written, but hey, that’s what you pay an editor for! I’m behind my own personal schedule with having A Sour Chord available, but that’s due to my ignorance on how this whole process works. I thought I could power through it more quickly than was really possible. I’m learning a lot as I’m going through things and am thankful that my life leads me the opportunities to not only learn this process, but to follow through with it. More updates coming soon and hopefully a sample chapter (once we have a final draft of one!) will go up on the site as soon as possible. Thanks for checking in! It didn’t occur to me until I just typed the title of this post that both of my first two books have three word titles. Completely unintentional, I assure you. Since my last update, a number of things have happened. So let’s catch you up, shall we? I launched this here website. It’s not entirely finished as a lot of the behind the scenes stuff that I built is relying on the first book being done and for sale. I finally found an editor that I’ve hired to do the final edit before the book can go on sale. Turns out one of my good buddy’s fiance is getting her Master’s in Creative Writing, so that’s a good fit. I look forward to being done with that process — the whole editing part has been my least favorite so far. Continue working on My Last Days and repeat the process. Is it wrong or am I insane that I already have an idea for the next book after My Last Days? I keep coming up with these ideas of stories that I knew or told or heard when I was younger and think they’d make good books. Since this whole process is rather easy, I figure why not? I’m in my 30s now and have the time and resources to do it, so why not be an author? I may not be the next Stephen King or J. K. Rowling, but I’m doing the best I can!